[all-seasons rewatch] [major arc; titular episode of the season] Emperor Turhan, of the Centauri Republic, comes to Babylon 5 to make an announcement. Londo and G'Kar pass each other, like ships in the night... "Oh, enough [regrets] to fill a lifetime. So much has been lost, so much forgotten. So much pain, so much blood. And for what, I wonder? The past tempts us, the present confuses us, and the future frightens us. And our lives slip away, moment by moment, lost in that vast terrible in-between. But there is still time to seize that one last, fragile moment. To choose something better, to make a difference, as you say. And I intend to do just that." -Turhan fails to give his apology publicly because of his illness, but tells Franklin to tell G'kar of his plans. G'Kar is humbled, and in a fit of optimism and hope buys Londo a drink to attempt to bridge the divide between their people. -Meanwhile, Londo and Refa are plotting against Turhan, who they believe to be the cause of the Republic's weakness. To sway their supporters on Centauri Prime, Londo and Refa plot to attack a Narn colony. Londo, against Vir's advice ("But someday I’m going to remind you of this conversation, and maybe then you’ll understand. "), gets Vir to contact Mr. Morden to pre-bomb the colony for the Centauri attack. The attack succeeds, and as far as the Narn know the Centauri took the colony--alone. -Back to that drink. G'Kar tries to make friends with a very guilty-looking Londo. Londo knows, but G'kar doesn't, that Londo is responsible for the deaths of another few thousand Narn. -Turhan meets Kosh, which he had hoped to do at the beginning of the episode. -Turhan whispers something to Londo just before he dies. Londo and Refa spin this as a mandate to 'take [his] people back to the stars' and return the Centauri Republic to its former glory; Londo privately admits that Turhan actually said that they were damned. Refa replies, "Well, it's a small enough price to pay for immortality." -Meanwhile, they've had the prime minister assassinated on Centauri Prime. -Londo dreams. The attack either Ragesh III (episode 1) or the last time he used the Shadows to attack a Narn outpost. "Keep it up, G'kar, and soon you won't have a planet to protect!" A hand reaching out of a sun. Londo seeing the strange many-legged Shadow ships flying over Centauri Prime. Londo being crowned Emperor. A decrepit, grey, coughing, and liver-spotted Londo on the throne, as an eye-patch-wearing G'kar chokes the life from him. Londo awakes, and says, "The time, what is the time? [looks at a clock] ...It has begun." -G'kar has found out about the attack and straight-up tries to kill Londo in a state of utmost grief (even breaking his stone table in two), but is restrained before he does anything irreversible. The Narn declare war on the Centauri. -Meanwhile, Garibaldi is being followed by a man who has a message from Sinclair (now the ambassador to the Minbari). It turns out he is a Ranger, a member of an "army" who have been on B5 for about two months. "The bearer of this message is one of my Rangers. Some are Minbari; most are human. Their job for now is to patrol the frontier... to listen, to watch, and to return with reports too sensitive to trust to regular channels. They are my eyes and ears. Where you see them, you see me. They've been drawn here to learn to work together and prepare for the fight ahead. In the name of our friendship I wish that you give them every courtesy and co-operation. I wish I could tell you more. I wish I could warn you. But the others don't think it's time yet. Stay close to the Vorlon... and watch out for Shadows. They move when you're not looking at them." The all-spoiler discussion, since in hindsight this episode might be the most important episode of seasons 1, 2, and arguably 3. Yeah, very hard to discuss this episode deeply in a spoiler free way. I just finished the whole series, and have some Thoughts about this one. First among those, is this the first time we see Londo’s dream? I seem to recall at some point he talks about this being a recurring nightmare, but I don’t remember when we first see it or exactly when he first talks about it. He mentions in the first episode that he has had a lifelong, pre-meeting-G'Kar a dream of G'Kar strangling him to death (and also the first discussion that Centauri psi-abilities tends towards precognizance instead of humanity's mind-reading). No visual before now, AFAIK. I had never seen this episode before, though I'd seen many after it. The "ships passing in the night" nature of the Emperor's communication to G'Kar and Londo's simultaneous betrayal (with the bar scene immediately after, when it's too late to change course, but information is not yet evenly distributed) is almost too on-the-nose but it really does underscore a lot of things that will continue with the through-line of the series..
Turhan Bey is the name of the actor who portrayed the Emperor (who will also be named Turhan, later). It looks like B5 was the last stop of his career as an actor. First among those, is this the first time we see Londo’s dream? It's first referenced/described in "Midnight on the Firing Line" (in fact, this episode has other parallels with that episode, in terms of some of the same things happening, just with different players & different meanings behind them). But here we get the visuals - old Londo, sitting on the throne; G'Kar, wearing an eyepatch. It's one of those events in the series that each time we see it, we learn something new - until we learn in War Without End that Londo is doing it because he needs to be killed before his watcher raises the alarm about things; and then even later we learn that by that time G'Kar and Londo are indeed old friends. It's a fascinating through-line in the series; that dream is one of the earliest things we know about the characters, but what it means changes each time we learn something. Which fire do you think Kosh’s “in fire” refers to? To me it seems like it should be the fires Centauri Prime eventually has (evidently during all of Londo’s reign), but there’s a bunch of other options along the way. 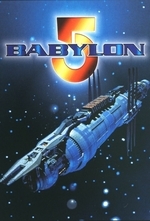 From what I understand, if the original five season plan had survived the whims of the television season renewal process unscathed, Kosh's "in fire" would have been in reference to the same scene shown earlier back in season one in the episode Signs and Portents, when the Centauri seer, Lady Ladira, had a vision of Babylon 5 blowing up just after a lone shuttle launched from the dock. As the five season plan stood at the beginning of season one this scene was outlined to supposed be from the series finale where the station was attacked by the Mimbari warrior caste (whom had staged a coup against the Gray Council at the beginning of season five), and Sinclair, his wife Delenn, and their newborn son barely escaping in that shuttle. Of course, reality ensued. Jeffrey O'Hare took the time off from the series that he so desperately needed due to his condition, Boxleitner comes in as the replacement lead, plot points get shuffled, and then in season four, the story gets condensed in a panic for fear that there wasn't going to be a season five. They filmed the series finale, Sleeping in Light, at the end of Season 4's production, and the vision from season one had to be recontextualized. Instead of the station falling to an attack, it was merely self-destructing after being decommissioned. Then TBS came along and said "I hear you want to do a fifth season of your show," and all the rush to get through the end of the story by the end of season 4 turned out to be for nothing. They held off from airing Sleeping In Light, saving it for the end of season five. As with most Kosh-isms, the meta-textual read is that it's an intentionally ambiguous statement that was written to apply to multiple potential outcomes (the end of the series, the end of the Empire, &c.). My personal canon is that Kosh -- who, timey-wimey parts of the show and prophetic dreaming aside -- means that all hope of averting a conflict between the Narn and the Centauri, who Kosh knows (but will not reveal to the Emperor) are backed by the Shadows and will pursue war at all costs: and if they won't, then the Vorlorns will eventually pursue a war with the Shadows, that will draw in the Centauri. I think that because it's the most significant thing to the Emperor at that moment: not the health of Centauri Prime, but the health of the Centauri Republic, and Kosh has good reason to think there's no way for the Republic to avert all wars with everyone in the near term. Londo is not only damned, but through his actions has damned the Republic. Every time I re-watch this, I'm more impressed by how Katsulas (and Jurasik) sell this episode. Katsulas manages to sell G'Kar as being momentarily unhinged without being absurd; Jurasik continues to nail the shifting moods of Londo between preening overconfidence and resigned concern. Their personal arcs are some of my favorite parts of the show, and this is -- as the episode possibly too-heavily signposts -- the biggest single turning point for both of them, and the last chance for either of them to go down different roads. Their personal arcs are some of my favorite parts of the show, and this is -- as the episode possibly too-heavily signposts -- the biggest single turning point for both of them, and the last chance for either of them to go down different roads. This is a big turning point, yes, but not the final one. They both have big moments ahead: G'Kar will find a different meaning & path as the Narn government in exile by the end of the war, eventually becoming a spiritual leader after an attempt to get at Mollari via psychic means leads to self-realization (guided/aided/manipulated by Kosh). Mollari's path is longer and more torturous - he gets everything he wants, but the victory is Pyrrhic and he find himself trying to limit the damage he has caused. Londo never really gets out from under this moment - he will pay the price for his Faustian bargain the rest of his days - but he does redeem himself, after a time.